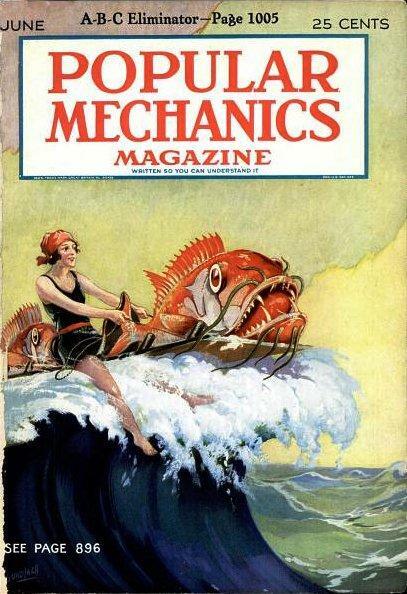 Popular Mechanics, June 1927, Cover. 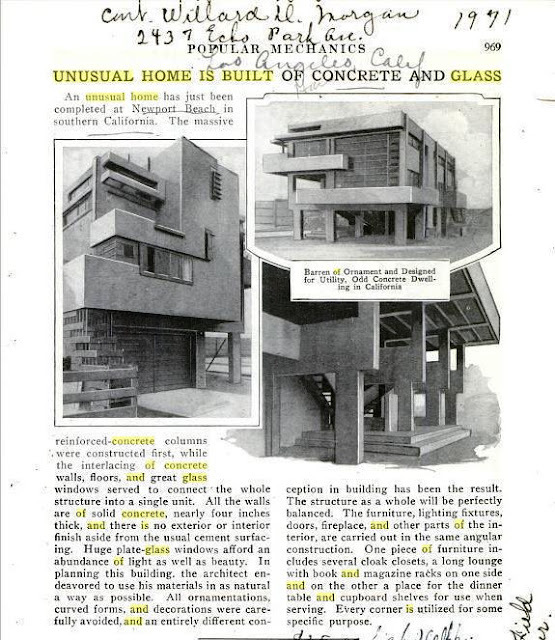 I recently happened upon the above June 1927 issue of Popular Mechanics, in which R. M. Schindler's Lovell Beach House (see below) was first published by close friend, photographer and free-lance writer Willard D. Morgan. I was immediately struck by the thought that the cover art work must have provided the inspiration for Schindler's soon-to-follow rendering for the Braxton-Shore Residence proposed to be built on Venice Beach. (See later below). If the striking house had been built it would still stand out as a beacon of modernism among more recent Venice Beach work by Frank Gehry, Patrick Tighe, and others. For more on the fascinating relationship between Schindler, Galka Scheyer and Henry Braxton see my "Pauline Gibling Schindler: Vagabond Agent for Modernism." For much more on Morgan and his artist wife Barbara and their important roles in the evolution of modernism in Southern California, see my "Foundations of Los Angeles Modernism: Richard Neutra's Mod Squad." [Morgan, Willard D.], "Unusual Home Built of Concrete and Glass," Popular Mechanics, June 1927, p. 969. 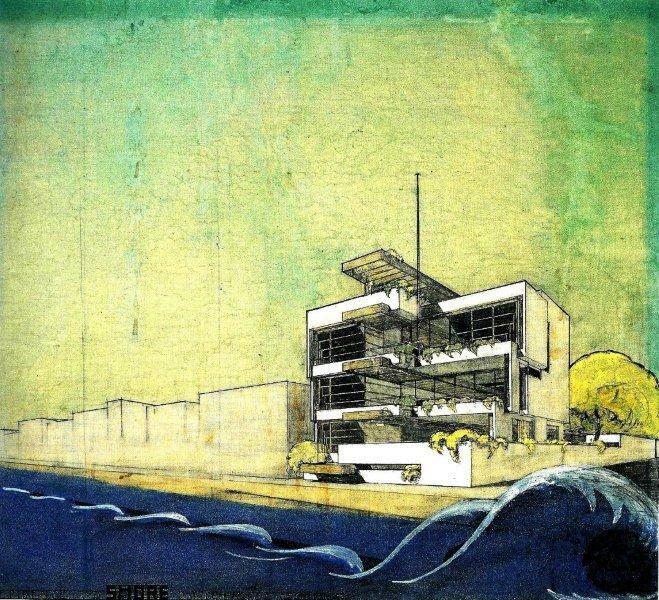 R. M. Schindler rendering, Harry Braxton and Viola Brothers Shore Residence, Venice Beach, 1928-30, unbuilt. 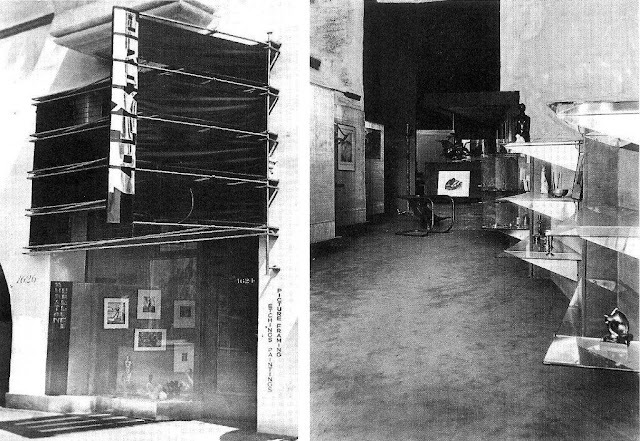 Braxton Gallery, 1929. Brett Weston photos. UC-Santa Barbara Architecture and Design Collections, Schindler Collection. For much more on Schindler's Braxton Gallery and Galka Schyer's role in making it a reality, see my "Richard Neutra and the California Art Club: A Pathway to the Von Sternberg and Murphy Commissions." 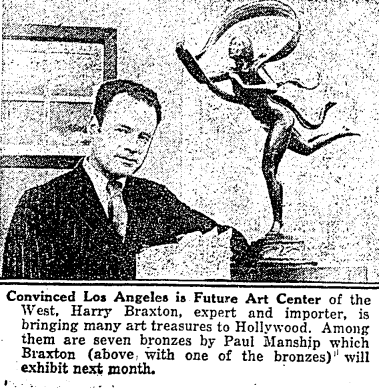 Harry Braxton, Los Angeles Times, February 26, 1929, p. II-8.